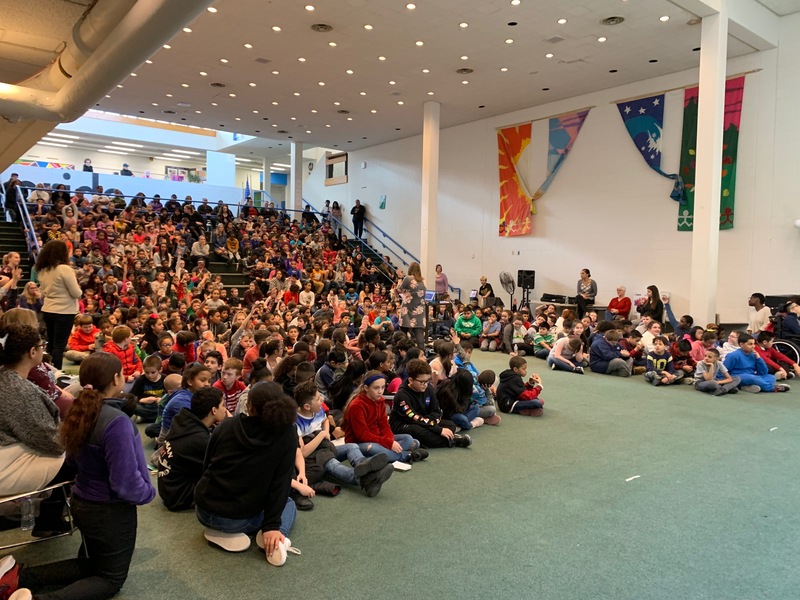 Today, I gave a talk to around 475 kids in grades 2 through 5 at Hayden Mcfadden Elementary School in New Bedford, MA (the city I call home) during their monthly assembly. The assemblies are for recognizing kids who exhibit the value of the month (respect was this month’s), read 5 or more books, and exceptional attendance. They also have a guest speaker talk about their career. Today was my day to talk about being a web developer! If you have the opportunity to speak to kids, I highly recommend doing this. With the hope of inspiring others to give similar talks, I wanted to share some takeaways from my experience, some inspiration I found while creating my talk, and a little information about how I approached the topic. TL;DR: Every child deserves access to computer science. Imagine if only 3% of people were literate. In America, that is the percentage of people that can read and write code . We are surrounded by computers more and more every day but so few know how technology actually works. Kids are growing up interacting with computers in ways we could have never imagined. Understanding how computers work and basic computer science is something that can be invaluable. It teaches critical thinking, problem solving, organizational skills, and so much more. Introducing kids to computer science is incredibly important. Understanding how things work will be a critical part of the next generation’s success. Before I talked, the kids were asked “Who likes computers?” Almost every single hand went up. Kids are so enthusiastic about technology! We need to make sure this is recognized and supported. Computers are not boring pieces of metal, plastic, and silicone. They are vehicles for creativity. Adults need to embrace this and instill this in children. They also asked fantastic questions! This was an incredibly insightful question that caught me off guard. Kids recognize that adults spend lots of time working. They can sense when you enjoy something (and when you don’t). My answer, of course, was that I love my job, and that it’s very important to find something you love to do. Here are some talks and resources for teaching kids about computers that I found while creating my talk that inspired me. Code.org is a non-profit organization dedicated to expanding access to computer science in schools all over the world. Over 22,688,014,058 lines of code have been written by 38 million students. They have developed structured computer science courses for all grades that are being used in schools across the globe. I highly recommend this talk from Ali Partovi, the co-founder of code.org. Linda Liukas is a children’s book author that uses stories and activities away from computers to help kids understand how they work. She challenges them to see computers for their creative potential, not just as boring pieces of metal and plastic. She also created Hello Ruby. Her enthusiasm is intoxicating! You can find several Ted Talks from her, but this was my favorite. Debbie Sterling is a female engineer that struggled with the feeling she did not fit in throughout much of her life. This “out of place” feeling was caused by the cultural ideals of what girls are supposed to be interested in. She wanted to solve problems, practice math, and build things, but society continually pushed her towards interests more traditionally aimed at females (even as an adult). This inspired her to create a line of engineering toys for girls called Goldieblox. Despite resistance from toy companies, she eventually discovered that girls around the world were just like her and were thirsting to be challenged with math, science, and engineering problems (just like boys)! So, what did I talk about? I started off by explaining remote work. Instead of driving to work every day, I work from my home with my cat and dog keeping me company (easy points with kids if you include pet photos). But, I really could work from anywhere I wanted with a connection to the Internet. Next, I challenged their ideas of what a computer is. After a few kids described what a computer is to them (including one girl who knew what CPUs and memory were! ), I showed them a few photos and asked them to identify which were computers. The photos included a farm, my cat, a car, toilets, and a traffic light. There were lots of different opinions, and many were shocked when I broke the news that all of them were computers. I explained that the farm has sensors in the soil so the crops are only watered when they need to be. My cat has a chip under her skin with our address and telephone number stored on it, just in case she runs away. The toilets have sensors that tell the them to flush when it detects movement. This was a fun exercise they really enjoyed. It challenged the perception that computers are just rectangular boxes with screens. With today’s technology and the emerging Internet of Things (IoT), anything can be a computer! Next I explained that computers don’t talk like us. Everything we type into the computer is converted into binary. I explained that computers are not smart on their own. They are only as smart as the instructions they are given. Programming is when someone writes instructions and rules for a computer to follow. Web development is writing programs that are used on the Internet. I talked about when I discovered my love for computers. I remember fixing the computer in my second grade classroom so I could play Number Munchers. Eventually, I was fixing computers and printers all around the school when IT was not around. I loved taking things apart, learning how they worked, and putting them back together again. I talked about going to college, working hard and making as many websites as I could. Jobs and skills are just like playing sports, you have to practice to get better. I explained that one day I found WordPress, what Open Source is, and why it’s so great. I explained what hosting companies are and showed them a data center. Special computers are programmed to send websites to those requesting them on the Internet. Provided context of just how many people have WordPress sites (over 3 Massachusetts worth!) and that WordPress can be used in over 200 languages (about 2/3 of the kids identified as speaking more than one language). I mentioned that I get to travel the world to attend conferences, hear industry leaders talk, and to collaborate in person with other WordPress community members who also work remotely. I detailed how I get to meet Bluehost customers, help them with their website problems, and learn about what they need from WordPress. Discussed how I work with incredibly smart people that challenge me every day. Always ask questions. Be curious! And finally, I brought it home with a video of several people that I have met throughout my career saying hello, and detailing why they love building the Internet. Thank you, Bluehost, for supplying stylish sunglasses for every kid in attendance today. Ms. Reis’ 2nd grade class sporting their cool new shades. Thank you to the WordPress Community Team for sending stickers and pins for the kids on short notice. Also, a huge thank you goes out to Angela Jin, Johnny Harris, Joost de Valk, John Blackbourn, Francesca Marano, Tammie Lister, Josepha Haden Champhosy, and Felix Arntz for taking the time to make those videos. Thank you for making programming cool! That sounds like a really fun presentation for kids, and even mind-expanding. I bet that was enjoyed by all, and may have been a life-changing presentation for a few of them. And thanks for sharing about it.